Mast cells are effector cells that mediate the allergic response through Ag stimulation of IgE bound to FcεRI. In allergic reactions, cross-linking of the surface receptors for IgE on mast cells results in the synthesis of Th2 cytokines such as IL-4 and IL-13, which are critical for the initiation and progression of the allergic response. Despite the important roles of these cytokines, the signaling mechanism by which Ag stimulation mediates the production of IL-4 and IL-13 in mast cells is not clearly understood. In the present study, we found that Ag-stimulated bone marrow-derived mast cells (BMMCs) highly upregulated the expression of BLT2, a leukotriene B4 receptor, and that blockade of BLT2 with the specific antagonist LY255283 or small interfering RNA knockdown completely abolished the production of Th2 cytokines. Furthermore, BMMCs overexpressing BLT2 showed significantly enhanced production of Th2 cytokines compared with wild-type BMMCs. Additionally, we found that the generation of Nox1-derived reactive oxygen species occurs downstream of BLT2, thus mediating the synthesis of Th2 cytokines. Taken together, our results suggest that the BLT2-Nox1-reactive oxygen species cascade is a previously unsuspected mediatory signaling mechanism to Th2 cytokine production in Ag-stimulated BMMCs, thus contributing to allergic response. Mast cell-derived mediators play central roles in the initiation of inflammatory reactions associated with atopic asthma and other allergic disorders (1). Mast cells express the unique high-affinity IgE receptor, FcεRI, on their surfaces. Cross-linking of cell surface IgE bound to FcεRI by Ag leads to the rapid release of inflammatory mediators, including histamine, proteases, arachidonic acid metabolites, and various cytokines (2). Th2 cytokines (e.g., IL-4 and IL-13) produced by mast cells regulate important inflammatory responses in asthma (3–5). Despite the important role of mast cells in the synthesis of Th2 cytokines, the signaling mechanism by which Ag stimulation mediates Th2 cytokine production in mast cells is not well understood. Accumulating evidence suggests that the interaction of FcεRI with Src kinase, Lyn, Fyn, and other tyrosine kinases initiates Ag stimulation-induced intracellular signaling in mast cells. Thus, these kinases are suggested to be important for the de novo synthesis of various cytokines, including IL-4, IL-13, IL-6, and TNF-α (6). Recently, a number of studies have reported that stimulation of mast cells through FcεRI causes the production of intracellular reactive oxygen species (ROS); such compounds have been shown to act as second messengers in the signal transduction pathway leading to cytokine synthesis (7–9). However, neither the source of ROS generated in response to Ag stimulation nor the pathway by which they are generated in Ag-stimulated mast cells is clearly understood. Leukotriene B4 (LTB4) is a potent lipid mediator derived from arachidonic acid by the action of 5-lipoxygenase; it is one of the most potent known chemoattractants, acting primarily on neutrophils, eosinophils, T cells, and mast cells (10–14). LTB4 has been widely implicated in the pathogenesis of several inflammatory diseases, including asthma, psoriasis, rheumatoid arthritis, and inflammatory bowel disease (15–17). Several recent lines of evidence point to a potential regulatory role for LTB4 in cancer progression (18–20). The actions of LTB4 are mediated by two cell surface receptors, BLT1, which is predominantly expressed in peripheral blood leukocytes, and BLT2, which is expressed ubiquitously (21–23). Previous studies have reported that both BLT1 and BLT2 are expressed in human and murine mast cells and also that both receptors contribute to the chemotactic migration of mast cells toward LTB4 (12, 23). A previous study from our laboratory has shown that BLT2 plays a critical role in the pathogenesis of asthma, especially with regard to airway inflammation and airway hyperresponsiveness (AHR) (24). However, the role of BLT2 in mast cells in asthmatic pathogenesis has not been elucidated. In the present study, we found that Ag-stimulated mast cells show significant upregulation of BLT2 expression and enhanced ROS generation. Furthermore, knockdown of BLT2 with small interfering (si)RNA clearly abolished the enhanced ROS generation and the synthesis of IL-4 and IL-13 in mouse bone marrow-derived mast cells (BMMCs); this suggests that BLT2 plays a critical mediatory role in the synthesis of Th2 cytokines (IL-4 and IL-13) in mast cells in response to Ag stimulation. Consistent with this idea, BMMCs that overexpress BLT2 show significantly enhanced Th2 cytokine synthesis that is significantly reduced by Nox1 siRNA, suggesting Nox1-derived ROS generation as a potential downstream mediator of BLT2. Taken together, our results suggest that the BLT2-Nox1-ROS cascade is a downstream signaling pathway mediating the synthesis of Th2 cytokines (IL-4 and IL-13) in Ag-stimulated mast cells and that targeting this pathway could be useful in the development of anti-asthma therapy. Mouse monoclonal anti-DNP IgE (clone SPE-7), DNP-conjugated BSA (DNP-BSA), DMSO, diphenylene iodonium (DPI), N-acetylcysteine (NAC), and 2,7-dichlorofluorescein diacetate (DCFDA) were purchased from Sigma-Aldrich (St. Louis, MO). LTB4, 12(S)-hydroxyeicosatetraenoic acid (HETE), U75302, and LY255283 (25) were purchased from Cayman Chemical (Ann Arbor, MI). Human BLT2 (GenBank accession no. NM019839.1 under http://www.ncbi.nlm.nih.gov/genbank/; UniProtKB/Swiss-Prot accession no. Q9NPC1 under http://www.ebi.ac.uk/uniprot/) was cloned by PCR methods using the human genomic bacterial artificial chromosome library as described previously (26, 27). RPMI 1640, antibiotic, and antimycotic compounds and nonessential amino acids were purchased from Invitrogen (Grand Island, NY). The BLT2 transgenic (TG) and wild-type (WT) mice (strain FVB) used in this study have been previously described (28). Mouse BMMCs were obtained by in vitro differentiation of bone marrow cells taken from mouse femurs and cultured in RPMI 1640 supplemented with 10% FBS, 2 mM l-glutamine, 100 U/ml penicillin, 100 μg/ml streptomycin, nonessential amino acids, 50 μM 2-ME, sodium pyruvate, and HEPES buffer containing 20 ng/ml stem cell factor and 10 ng/ml IL-3 (R&D Systems, Minneapolis, MN) for 4–8 wk (29). After 4 wk, 1 × 106 BMMCs/ml were stained with FITC-conjugated rat anti-mouse c-Kit mAb or FITC-conjugated rat IgG2a isotype control (BD Pharm Lyse; BD Biosciences, San Diego, CA) and analyzed by flow cytometry (FACSCalibur; BD Biosciences, Franklin Lakes, NJ). Purity was usually >97%. BMMCs were sensitized overnight with an optimal concentration (1 μg/ml) of monoclonal anti–DNP-specific IgE in cytokine-free medium and then serum-starved in RPMI 1640 containing 0.5% FBS for an additional 6 h before being stimulated with DNP-BSA (100 ng/ml) for the indicated times. To analyze the level of BLT2 expression, cells were fixed with 3% paraformaldehyde and permeabilized with 0.1% Triton X-100 in PBS. After being blocked with 2% BSA for 30 min, cells were incubated with the primary Ab (rabbit polyclonal anti-BLT2; Cayman Chemical) (30–32). Cells were then washed three times with PBS and incubated with FITC-conjugated anti-rabbit IgG (Invitrogen, Carlsbad, CA). Cells (10,000/sample) were then analyzed with a flow cytometer (FACSCalibur) using CellQuest software, as described previously (32). Data are expressed as the mean fluorescence intensity. Total cellular RNA was extracted using easy-BLUE (Intron, Sungnam, Korea), after which 2 μg of the extracted RNA was reverse-transcribed using Moloney murine leukemia virus reverse transcriptase (Invitrogen) and amplified for BLT1, BLT2, Nox1, IL-4, IL-13, and GAPDH using an RT-PCR PreMix kit (Intron). For semiquantitative analysis of transcripts, we first determined the optimal PCR conditions for linear amplification of GAPDH. The primers used were 5′-AATGCCCAGGATCGAGGT-3′ (forward) and 5′-GATGGAAGCAAAGGGAGTGA-3′ (reverse) for Nox1; 5′-CTGTAGGGCTTCCAAGGTGCTTCG-3′ (forward) and 5′-CCATTTGCATGATGCTCTTTAGGC-3′ (reverse) for IL-4; and 5′-ATCTACAGGACCCAGAGGATATTG-3′ (forward) and 5′-CTGATGTGAGAAAGGAAAATGAGT-3′ (reverse) for IL-13. The primers for BLT1 and BLT2 have been previously described (24). The specificity of all the primers was confirmed by sequencing the PCR products. For the real-time PCR reactions, a LightCycler 480 SYBR Green I Master (Roche Diagnostics, Mannheim, Germany) was used according to the manufacturer’s instructions. The sensitized BMMCs were stimulated with DNP-BSA (100 ng/ml) for 24 h, after which the conditioned media were collected and immediately frozen. The collected media were then lyophilized, and the levels of IL-4 and IL-13 were quantified using an ELISA kit (BD Biosciences) according to the manufacturer’s instructions. To knock down BLT2 or Nox1, BMMCs were transfected with BLT2 siRNA (Bioneer, Daejeon, Korea) or Nox1 siRNA (Invitrogen) using the MP-100 MicroPorator (Digital Bio, Seoul, Korea) according to the manufacturers’ instructions. Briefly, 1 × 106 cells in 100 μl of resuspension buffer (Digital Bio) containing scrambled siRNA, BLT2 siRNA, or Nox1 siRNA (final 50 nM) were electroporated using one pulse of 1400 V for 30 ms. Cells were cultured in complete medium without antibiotics for 48 h, and the mRNA level of BLT2 or Nox1 was then analyzed by RT-PCR to evaluate the level of interference. To prepare BLT2-overexpressing cells, BMMCs (1 × 106 cells) were transiently transfected with pcDNA3.1-BLT2 (27) or pcDNA3.1 using the MP-100 MicroPorator according to the manufacturer’s instructions. Briefly, 1 × 106 cells in 100 μl resuspension buffer containing 2 μg pcDNA3.1-BLT2 or pcDNA3.1 were electroporated using one pulse of 1400 V for 30 ms.
Intracellular ROS levels were determined by measuring DCF fluorescence with a flow cytometer (FACSCalibur) as previously described (33). Briefly, BMMCs were incubated for 20 min with the ROS-sensitive fluorophore DCFDA (10 μM), washed with PBS, and immediately analyzed. Female BALB/c mice (7 wk old; 18–20 g) were obtained from Orient Bio (Seoungnam, Korea). BALB/c mice were sensitized on day 1 by i.p. injection of 20 μg OVA emulsified in 2.5 mg of alum (Pierce, Rockford, IL), followed by an identical booster injection administered on day 14. On days 21, 22, and 23 after initial sensitization, the mice were challenged for 30 min with an aerosol of 1% OVA using an ultrasonic nebulizer. LY255283 (5 mg/kg; Cayman Chemical) or vehicle control (DMSO) was administered i.v. 1 h before challenge with 1% OVA. Mice were killed on day 25 to assess asthmatic phenotypes. All experimental animals used in this study were treated according to guidelines approved by the Institutional Animal Care and Use Committee of Korea University. Airway function was assessed by measuring changes in lung resistance (RL) and dynamic compliance in response to increasing doses (from 5 to 40 mg/ml) of inhaled methacholine aerosol. AHR was measured in unrestrained, conscious mice at 24 h after the final OVA challenge using a whole-body plethysmograph, as previously described (34). The mice were tracheostomized under anesthesia and connected to a computer-controlled small-animal ventilator (flexiVent; Scireq, Montreal, Quebec, Canada). Most of the data were assessed by the Student t test and expressed as mean ± SD. One-way ANOVA was used for comparison of multiple groups. In all cases the experiments were repeated three times with similar results and representative data are shown. The p values <0.05 were considered to indicate statistical significance. To determine whether BLT2 is associated with the Ag-stimulated signaling that regulates Th2 cytokine synthesis in mast cells, we first measured the expression level of BLT2 in BMMCs using FACS analysis with BLT2-specific Ab. As shown in Fig. 1A, nonstimulated (NS) cells showed a rightward-shifted peak relative to cells stained with the isotype control (IgG), indicating that BLT2 is expressed in these cells. Ag stimulation of BMMCs with DNP-BSA shifted the FACS curve to the right compared with nonstimulated cells, suggesting that Ag stimulation induces upregulation of BLT2 expression. Additionally, BLT2 transcript levels were analyzed by semiquantitative RT-PCR. The PCR analysis clearly demonstrated that the level of BLT2 transcripts in BMMCs was significantly upregulated by Ag treatment, with a maximal effect after 20–40 min of Ag treatment (Fig. 1B). Ag-induced Th2 cytokine synthesis in BMMCs is dependent on BLT2. A, BMMCs were stimulated with DNP-BSA (100 ng/ml) for 12 h and incubated with FITC-conjugated anti-BLT2 or an isotype control Ab (IgG). BLT2 expression was evaluated by flow cytometry. The results shown are representative of three independent experiments with similar results. B and C, BMMCs were activated with 100 ng/ml DNP-BSA for the indicated times, and the levels of BLT2, IL-4, and IL-13 were assessed by semiquantitative RT-PCR or real-time PCR. Data are means ± SD of three independent experiments. *p < 0.05 versus no treatment. D, BMMCs were incubated with 100 ng/ml DNP-BSA for the indicated times and the secretion of IL-4 or IL-13 was determined using a specific ELISA assay. Data are means ± SD of three independent experiments. *p < 0.05 versus no treatment. NS, nonstimulated. Mast cells are known to produce Th2 cytokines in response to Ag stimulation (35, 36). Consistent with these reports, we observed that the levels of IL-4 and IL-13 transcripts in BMMCs, as detected by semiquantitative RT-PCR (Fig. 1B) and real-time PCR analysis (Fig. 1C), are markedly elevated following Ag stimulation. We also measured the levels of IL-4 and IL-13 protein by ELISA. The synthesis of these Th2 cytokines was significantly elevated in a time-dependent manner following Ag stimulation of BMMCs (Fig. 1D). To test whether BLT2 plays any role in Ag stimulation-induced Th2 cytokine synthesis, we analyzed the effect of BLT2 blockade on Th2 cytokine levels using a BLT2-specific antagonist, LY255283 (24), and siRNA BLT2 knockdown. Treatment of BMMCs with LY255283 resulted in a dramatic attenuation of Ag-induced upregulation of Th2 cytokine transcripts (Fig. 2A, 2B). Similarly, knockdown of BLT2 using siRNA markedly reduced the Ag-stimulated induction of IL-4 and IL-13 at both the transcript and the protein level (Fig. 2C, 2E, 2F). Under these experimental conditions, the knockdown effect of BLT2 siRNA was clearly observed at the protein expression level (∼50% decrease in BLT2 protein) based on FACS analysis (Fig. 2D). This pattern is similar to that observed at the transcript level, as shown in Fig. 2C. Taken together, these results suggest that BLT2 is necessary for Ag-induced Th2 cytokine synthesis in BMMCs. BLT2 inhibition attenuates Ag-induced Th2 cytokine synthesis in BMMCs. A and B, BMMCs were pretreated for 30 min with LY255283 (10 μM) or DMSO and then activated with DNP-BSA (100 ng/ml) for 1 h. Thereafter, total cellular RNA was isolated and examined with semiquantitative RT-PCR or real-time PCR. Data are means ± SD of three independent experiments. *p < 0.05; **p < 0.01 versus no treatment. C, BMMCs were transfected with Scr siRNA or BLT2 siRNA (50 nM). After 24 h, cells were stimulated with DNP-BSA (100 ng/ml) for 1 h; total cellular RNA was then isolated, and the transcript levels of BLT2, IL-4, and IL-13 were assessed by semiquantitative RT-PCR. The results shown are representative of three independent experiments with similar results. D, BMMCs were transfected with Scr siRNA or BLT2 siRNA (50 nM). After 24 h, cells were stimulated with DNP-BSA (100 ng/ml) for 12 h and incubated with FITC-conjugated anti-BLT2 or isotype control Ab (IgG). E and F, BMMCs were transfected with Scr siRNA or BLT2 siRNA (50 nM) for 24 h and then activated with DNP-BSA (100 ng/ml) for 24 h. The levels of IL-4 and IL-13 were determined using a specific ELISA assay. Data are means ± SD of three independent experiments. *p < 0.05 versus DNP-BSA–induced cytokine synthesis in Scr siRNA-transfected cells. To further examine whether BLT2 is involved in the synthesis of IL-4 and IL-13 in Ag-stimulated mast cells, we prepared BMMCs that overexpress BLT2 by transiently transfecting the cells with a BLT2 expression plasmid (27). As shown in Fig. 3A, BLT2 expression alone resulted in a modest increase in the levels of transcripts for IL-4 and IL-13 cytokines. The addition of BLT2 ligands [LTB4 and 12(S)-HETE] further enhanced the levels of IL-4 and IL-13 transcripts in BLT2-overexpressing BMMCs compared with cells transfected with a control vector (Fig. 3A). Similarly, the protein levels of IL-4 and IL-13 were also modestly increased by BLT2 overexpression alone; the addition of BLT2 ligands further enhanced cytokine synthesis (Fig. 3B, 3C). In contrast to BLT2, BLT1 overexpression had no significant effect on cytokine production in BMMCs (data not shown). BLT2 overexpression induces Th2 cytokine synthesis in BMMCs. A–C, BMMCs were transiently transfected with pcDNA3.1 or pcDNA3.1-BLT2 for 24 h. A, The cells were incubated with 300 nM LTB4 or 12(S)-HETE for 1 h and then harvested for detection of BLT2, IL-4, and IL-13 transcripts by semiquantitative RT-PCR with specific primers. B and C, The cells were incubated with 300 nM LTB4 or 12(S)-HETE for 24 h. The levels of IL-4 and IL-13 were determined using a specific ELISA assay. Data are means ± SD of three independent experiments. #p < 0.05 versus pcDNA3.1/control treatment. *p < 0.05; **p < 0.01 versus BLT2/control treatment. To further examine the role of BLT2 in Th2 cytokine synthesis, we compared BMMCs from WT and BLT2 TG mice (28). We isolated BMMCs from WT and BLT2 TG mice and analyzed the levels of these cytokines using real-time PCR and ELISA. Our results clearly show that the levels of IL-4 and IL-13 are significantly enhanced in BMMCs derived from BLT2 TG mice compared with cells derived from WT animals (Fig. 4A–C). The addition of BLT2 ligands [LTB4 or 12(S)-HETE] further enhanced the production of IL-4 and IL-13 in BLT2 TG BMMCs. Furthermore, BLT2 knockdown with siRNA dramatically attenuated LTB4- and 12(S)-HETE–induced Th2 cytokine synthesis in TG BMMCs at both the transcript and the protein levels (Fig. 4D–F). BMMCs from BLT2 TG mice show enhanced Th2 cytokine production. A and B, BMMCs were incubated in RPMI 1640 containing 0.5% FBS for 6 h; total cellular RNA from WT or BLT2 TG BMMCs was then isolated and examined for transcript levels using semiquantitative RT-PCR or real-time PCR. Data are means ± SD of three independent experiments. *p < 0.05; **p < 0.01 versus WT BMMCs. C, BMMCs were incubated in RPMI 1640 containing 0.5% FBS for 24 h, after which the levels of IL-4 and IL-13 were determined using a specific ELISA assay. Data are means ± SD of three independent experiments. *p < 0.05; **p < 0.01 versus WT BMMCs. D, BLT2 TG BMMCs were transiently transfected with Scr siRNA or BLT2 siRNA (50 nM) for 24 h and incubated with 300 nM of both LTB4 and 12(S)-HETE for 1 h. These cells were harvested for detection of BLT2, IL-4, and IL-13 transcripts by semiquantitative RT-PCR with specific primers. E and F, BLT2 TG BMMCs were transiently transfected with Scr siRNA or BLT2 siRNA (50 nM) for 24 h and incubated with 300 nM of both LTB4 and 12(S)-HETE for 24 h. The levels of IL-4 and IL-13 were determined using a specific ELISA assay. Data are means ± SD of three independent experiments (*p < 0.05). A number of previous reports have shown that Ag-stimulated mast cells exhibit elevated ROS generation and that FcεRI-dependent ROS generation is diminished by treatment with DPI, an inhibitor of flavoenzymes, including NADPH oxidase (7–9, 37). Consistent with these reports, we found that ROS levels in BMMCs are indeed elevated following Ag stimulation (Fig. 5A and Supplemental Fig. 1) and that pretreatment with DPI or NAC, a free radical scavenger, significantly attenuated intracellular ROS production induced by Ag stimulation in BMMCs (Supplemental Fig. 1A). These results suggest a possible role for NADPH oxidases (Nox family) in Ag-stimulated ROS generation in mast cells. To test whether ROS play any role in Ag-stimulated Th2 cytokine synthesis in mast cells, BMMCs were pretreated with DPI or NAC; cells were then stimulated with Ag and the levels of Th2 cytokines were measured using quantitative RT-PCR or real-time PCR. Our results clearly demonstrate that DPI and NAC significantly inhibit Ag stimulation-induced IL-4 and IL-13 upregulation (Supplemental Fig. 1B, 1C), suggesting that ROS play a role in the FcεRI signaling pathway for IL-4 and IL-13 in BMMCs. Ag-induced ROS generation and Th2 cytokine synthesis in BMMCs occurs through a BLT2-Nox1 cascade. A and B, BMMCs were transfected with Scr siRNA or BLT2 siRNA (50 nM); after 24 h, they were stimulated with DNP-BSA (100 ng/ml) for 1 h. A, DCFDA (10 μM) was added for 20 min before ROS measurement. Intracellular ROS were measured by FACS analysis of DCF fluorescence. **p < 0.01 versus DNP-BSA–induced DCF fluorescence in Scr siRNA-transfected cells. B, Total cellular RNA was isolated and the levels of BLT2 and Nox1 transcripts were assessed by semiquantitative RT-PCR. The results shown are representative of three independent experiments with similar results. C and D, BMMCs were transfected with Scr siRNA or Nox1 siRNA (50 nM); after 24 h, they were stimulated with DNP-BSA (100 ng/ml) for 1 h. C, DCFDA (10 μM) was added for 20 min before ROS measurement. Intracellular ROS were measured by FACS analysis of DCF fluorescence. **p < 0.01 versus DNP-BSA–induced DCF fluorescence in Scr siRNA-transfected cells. D, Semiquantitative RT-PCR was performed to detect the transcript levels of Nox1, IL-4, and IL-13. E and F, BMMCs were transfected with Scr siRNA or Nox1 siRNA (50 nM) for 24 h; the cells were then activated with DNP-BSA (100 ng/ml) for 24 h. The levels of IL-4 and IL-13 were determined using a specific ELISA assay. Data are means ± SD of three independent experiments. *p < 0.05 versus DNP-BSA induced cytokine synthesis in Scr siRNA-transfected cells. We recently reported that Nox-derived ROS generation lies downstream of BLT2 (18, 32, 38). Based on this, we hypothesized that one potential mechanism of ROS generation could be through a BLT2-Nox–linked cascade in Ag-stimulated mast cells. In the present study, we tested this hypothesis and found that Ag-induced ROS generation is dramatically inhibited by BLT2 siRNA (Fig. 5A). Additionally, we found that Nox1 transcript levels are highly upregulated following Ag stimulation in BMMCs and that this Ag-induced Nox1 upregulation is significantly suppressed by BLT2 siRNA (Fig. 5B), suggesting that the elevation of Nox1-ROS levels occurs through a BLT2-dependent pathway in BMMCs. To further analyze the role of Nox1 in Ag-induced ROS generation, we transiently transfected BMMCs with Nox1 siRNA and analyzed changes in ROS levels in response to Ag stimulation. When Nox1 was knocked down by siRNA, Ag-induced Nox1 upregulation and subsequent ROS generation was significantly reduced (Fig. 5C, 5D). Importantly, the Ag-induced upregulation of Th2 cytokine transcripts was also evidently attenuated by siRNA knockdown of Nox1 (Fig. 5D). Similarly, the protein levels of Th2 cytokines, as analyzed by ELISA, were also markedly diminished by siNox1 (Fig. 5E, 5F), indicating that Nox1-derived ROS generation acts as a downstream component in the BLT2 pathway leading to IL-4 and IL-13 synthesis in Ag-stimulated mast cells. The proposed action of this Nox1-derived ROS generation downstream of BLT2 was further analyzed by overexpressing BLT2 in BMMCs. To accomplish this, we transiently transfected cells with a BLT2 expression plasmid and then measured the levels of ROS generation and Nox1 transcripts. Simply by overexpressing BLT2, we could observe modestly increased levels of ROS generation and Nox1 transcripts; the addition of BLT2 ligands [300 nM LTB4 and 12(S)-HETE] further enhanced these effects (Fig. 6). Similar results were obtained in BMMCs derived from BLT2 TG mice; in these cells, the addition of BLT2 ligands resulted in further enhancement of the levels of ROS generation and Nox1 transcripts (Fig. 7A, 7B). However, transfection with BLT2 siRNA apparently abolished these effects (Fig. 7A, 7B). Additionally, knockdown of Nox1 by siNox1 in these cells significantly attenuated the BLT2 ligand-induced upregulation of both IL-4 and IL-13 transcript (Fig. 7C) and protein (Fig. 7D, 7E) levels. Taken together, these data further support the idea that Nox1-derived ROS generation lies downstream of BLT2 and thus mediates the synthesis of Th2 cytokines in mast cells. BLT2 mediates Nox1-derived ROS generation in BMMCs. A and B, BMMCs were transiently transfected with pcDNA3.1 or pcDNA3.1-BLT2 for 24 h and incubated with 300 nM LTB4 or 12(S)-HETE for 1 h. A, DCFDA (10 μM) was added for 20 min before ROS measurement. Intracellular ROS were measured by FACS analysis of DCF fluorescence. Data are means ± SD of three independent experiments. *p < 0.05; **p < 0.01 versus BLT2/control treatment. B, The cells were harvested to detect the levels of Nox1 transcripts by real-time PCR with specific primers. Data are means ± SD of three independent experiments. *p < 0.05; **p < 0.01 versus BLT2/control treatment. BLT2-Nox1 cascade mediates the synthesis of Th2 cytokines in BLT2 TG BMMCs. A and B, BLT2 TG BMMCs were transiently transfected with Scr siRNA or BLT2 siRNA (50 nM) for 24 h and incubated with 300 nM LTB4 or 12(S)-HETE for 1 h. A, DCFDA (10 μM) was added for 20 min before ROS measurement; ROS were measured by FACS analysis of DCF fluorescence. Data are means ± SD of three independent experiments (*p < 0.05). B, Total cellular RNA was isolated and the levels of Nox1 transcripts were assessed by real-time PCR. Data are means ± SD of three independent experiments (*p < 0.05; **p < 0.01). C, BLT2 TG BMMCs were transiently transfected with Scr siRNA or Nox1 siRNA (50 nM) for 24 h and incubated with 300 nM LTB4 or 12(S)-HETE for 1 h. Total cellular RNA was isolated and the levels of IL-4 and IL-13 transcripts were assessed by semiquantitative RT-PCR. The results shown are representative of three independent experiments with similar results. D and E, BLT2 TG BMMCs were transiently transfected with Scr siRNA or Nox1 siRNA (50 nM) for 24 h and incubated with 300 nM LTB4 or 12(S)-HETE for 24 h. The levels of IL-4 and IL-13 were determined using a specific ELISA assay. Data are means ± SD of three independent experiments. *p < 0.05; **p < 0.01. Recently, we reported that BLT2 plays a pivotal mediatory role in the pathogenesis of asthma (24). To determine whether BLT2 plays a role in Th2 cytokine production in vivo, we tested the OVA-induced asthma mouse model. We measured the levels of cytokines in the lung tissue and bronchoalveolar lavage fluid (BALF) of mice with OVA-induced asthma to assess the effect of BLT2 inhibition on the levels of Th2 cytokines associated with asthmatic responses. In lungs from mice with OVA-induced asthma, IL-4 and IL-13 levels were markedly elevated compared with normal controls, and i.v. injection of a BLT2 antagonist, LY255283, significantly reduced the transcript levels of IL-4 and IL-13 in the lung tissue (Fig. 8A, 8B). We also detected significantly reduced levels of these cytokines in the BALF (Fig. 8C). 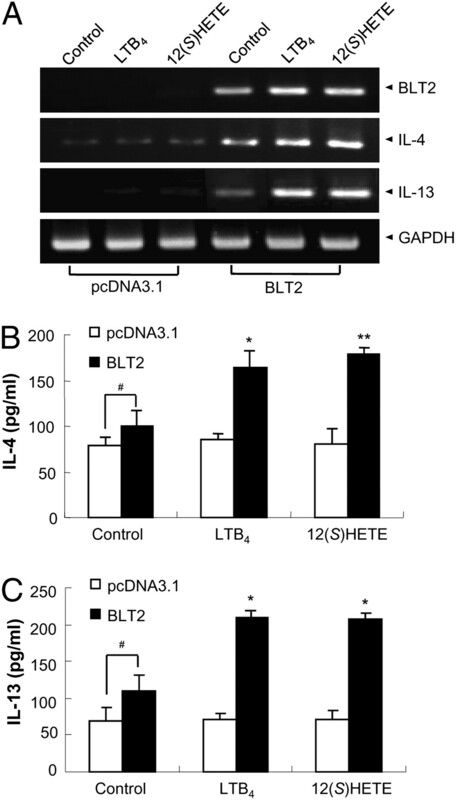 BLT2 blockade suppresses the synthesis of IL-4 and IL-13 in a mouse OVA-induced asthma model. A–C, Mice were injected i.v. with LY255283 (5 mg/kg) or vehicle (DMSO) 1 h before challenge with 1% OVA. The mice were killed on day 25 to assess asthmatic phenotypes. A and B, The lungs of the mice were analyzed for levels of IL-4 and IL-13 transcripts using semiquantitative RT-PCR or real-time PCR analysis. Data are means ± SD (n = 6/group). *p < 0.05; **p < 0.01 versus OVA/DMSO. C, BALF was analyzed for levels of IL-4 and IL-13 using a specific ELISA assay. Data are means ± SD (n = 6 in each group). *p < 0.05 versus OVA/DMSO. D and E, Lung tissue of WT/saline- or WT/OVA-challenged mice and BLT2 TG/saline- or TG/OVA-challenged mice were collected at 48 h after final 1% OVA challenge. The lungs were analyzed for transcript levels of IL-4 and IL-13 using real-time PCR analysis. Data are means ± SD (n = 4/group). *p < 0.05 versus WT/saline-challenged mice. F, Twenty-four hours after the last 1% OVA challenge, airway responsiveness was assessed (n = 3/group). *p < 0.05 versus WT/saline-challenged mice. We measured the levels of IL-4 and IL-13 in BLT2 TG mice. Basal levels of IL-4 and IL-13 were significantly higher in the lung tissue of BLT2 TG mice compared with those of normal control mice, and these effects were further enhanced by OVA challenge (Fig. 8D, 8E). Interestingly, we found that BLT2 TG mice showed a markedly increased RL with increasing doses of methacholine (5–40 mg/ml) (Fig. 8F). This RL value is comparable to that observed in OVA-challenged asthmatic mice that received 40 mg/ml methacholine (Fig. 8F), suggesting that the elevated levels of IL-4 and IL-13 in BLT2 TG mice may contribute to the enhanced AHR. In the present study, we found that Ag-stimulated synthesis of IL-4 and IL-13 in BMMCs occurs through a BLT2-dependent pathway. Additionally, our results demonstrate that Nox1-derived ROS generation lies downstream of BLT2 in mediating FcεRI signaling that affects Th2 cytokine synthesis in Ag-stimulated mast cells. The induced BLT2 expression and subsequent ROS generation via Nox1 upregulation are suggested to be critical for the synthesis of Th2 cytokines in Ag-stimulated mast cells, mediating the early asthmatic/allergic response. The role of BLT2 in the synthesis of Th2 cytokines was verified in BLT2 TG mice. Mast cells play a central role in the production of Th2 cytokines following Ag-stimulated FcεRI aggregation during the early allergic response (2). When allergic individuals are exposed to allergen, cross-linking of IgE on the surface of mast cells leads to the release of mediators, including Th2 cytokines, which cause early allergic responses (2, 39–41). Mast cell-derived factors play a critical role in sustaining the inflammatory response and in the recruitment of other immune cells, such as T cells, neutrophils, and macrophages, to inflammatory sites. The recruited T cells are also found in high numbers at sites of allergic inflammation, including the lungs of asthmatic patients, and are known as another source of Th2 cytokines, including IL-4, IL-5, and IL-13 (42, 43). IL-4 and IL-13 are key cytokines in the pathogenesis of asthma (3–5, 42, 43). Expression of IL-4 in the lungs of IL-4 TG mice elicits an inflammatory response characterized by epithelial cell hypertrophy, accumulation of macrophages, lymphocytes, eosinophils, and neutrophils, and an AHR response to inhaled methacholine (3, 42). Similarly, chronic pulmonary overexpression of IL-13 in mouse lungs results in a complex phenotype characterized by an eosinophil inflammatory response, goblet cell hyperplasia, and subepithelial fibrosis (4, 43). IL-13 also acts directly on bronchial tissues to promote mucus production and AHR (4, 43). Additionally, elevated IL-13 levels have been detected in the airways and sputum of patients with asthma (43). Recent studies have demonstrated that stimulation of mast cells through FcεRI induces the production of intracellular ROS, which act as second messengers in a signal transduction pathway leading to degranulation and cytokine synthesis (7–9, 37, 44, 45). We also previously reported that the BLT2 cascade plays a mediatory role in the generation of ROS (18, 32, 38). Additionally, previous studies have reported that BLT2 is expressed in human and murine mast cells (23). Based on this evidence, we hypothesized that one potential mechanism by which Ag-FcεRI stimulation mediates IL-4 and IL-13 synthesis in BMMCs could be through a BLT2-ROS–dependent pathway. In the present study, we showed that ROS generation in BMMCs is increased by the addition of Ag and that this enhanced ROS production is dramatically inhibited by treatment of BMMCs with BLT2 siRNA. To examine whether Nox mediates ROS generation, we analyzed the mRNA levels of Nox family members in mouse BMMCs. Incubation with Ag induced the upregulation of Nox1 transcripts but had no effect on Nox2 or Nox4 transcript levels (data not shown), and transfection with siNox1 markedly reduced Ag-mediated ROS generation and Th2 cytokine production in BMMCs (Fig. 5C–F). These data suggest that Nox1 acts downstream of ROS generation in Ag-stimulated mast cells, thus mediating the synthesis of Th2 cytokines. Consistent with our observation, DPI-sensitive flavoenzymes such as Nox were previously suggested to be involved in Ag-mediated ROS production in mast cells (44, 45). We found that transient transfection with a BLT2 expression plasmid alone caused a modest increase in Nox1 transcript levels, ROS generation, and Th2 cytokine synthesis and that the addition of BLT2 ligands further increased these effects (Figs. 6, 7). Finally, in BMMCs from BLT2 TG mice, the levels of Nox1 transcripts, ROS generation, and IL-4/IL-13 synthesis were modestly enhanced compared with WT BMMCs (data not shown; Fig. 4A–C). The addition of BLT2 ligands further enhanced these effects, which were completely abolished by siRNA knockdown of Nox1 (Fig. 7). Taken together, these results suggest that Nox1 upregulation and subsequent ROS generation lie downstream of BLT2 and that this BLT2-Nox1-ROS cascade is responsible for increased Th2 cytokine synthesis in Ag-stimulated mast cells. Our observation that the ROS levels in the BALF of BLT2 TG mice are significantly increased compared with those of normal mice (data not shown) supports the idea that ROS generation lies downstream of BLT2. The presence of enhanced basal levels of IL-4 and IL-13 in the lung tissue of BLT2 TG mice is likely to be responsible for the enhanced AHR, as assessed by the RL (Fig. 8F) that occurs in these animals when they are given increasing doses of methacholine. However, the details of the mechanism by which enhanced RL occurs in BLT2 TG mice that do not undergo OVA challenge remain to be determined. Further studies are necessary to understand the detailed underlying mechanisms by which mast cells contribute to the synthesis of IL-4 and IL-13 in BLT2 TG mice (Fig. 8D, 8E) and/or to what extent the BLT2 upregulated mast cells contribute to the elevated levels of IL-4 and IL-13 in our murine model of allergic asthma (Fig. 8A–C). To our knowledge, this is the first report that defines the role of BLT2 in ROS generation and Th2 cytokine synthesis in Ag-stimulated mast cells. We suggest that BLT2 upregulation in mast cells following Ag stimulation is critical for ROS generation and subsequent Th2 cytokine synthesis and that these processes are essential for initiating and sustaining the allergic response in the airway. A better understanding of the BLT2-linked pathway in mast cells and the possible role of BLT2-mediated allergic signaling in other cell types will help us to clarify their roles in the pathogenesis of Ag-induced allergic reactions. Furthermore, our finding that a BLT2-Nox1-ROS cascade is involved in Ag-stimulated Th2 cytokine synthesis in mast cells could serve as the basis for the development of new treatments for allergic disease. This work was supported in part by a Korea Research Foundation grant funded by the Korean Government (Basic Research Promotion Fund; KRF-2008-313-C00603), a General Researcher Support Project grant (2010-0008295), and a Diseases Network Research Program grant (2009-0084183) from the Ministry of Education, Science and Technology, South Korea. Additionally, this work was supported by a grant from the Korea Institute of Science and Technology Institutional Research and Development Program and also by a special Korea University grant. 2004. Mast-cell responses to pathogens. Nat. Rev. Immunol. 4: 787–799.
. 2008. The mast cell and allergic diseases: role in pathogenesis and implications for therapy. Clin. Exp. Allergy 38: 4–18.
. 1999. Synergistic effects of interleukin-4 or interleukin-13 and tumor necrosis factor-α on eosinophil activation in vitro. Am. J. Respir. Cell Mol. Biol. 20: 474–480. 1998. The role of IL-13 and its receptor in allergy and inflammatory responses. J. Allergy Clin. Immunol. 102: 165–169.
. 2004. The role of human mast cell-derived cytokines in eosinophil biology. J. Interferon Cytokine Res. 24: 271–281.
. 2006. Integrated signalling pathways for mast-cell activation. Nat. Rev. Immunol. 6: 218–230.
. 2007. The role of reactive oxygen species and nitric oxide in mast cell-dependent inflammatory processes. Immunol. Rev. 217: 186–205.
. 2008. The phosphoinositide 3-kinase-dependent activation of Btk is required for optimal eicosanoid production and generation of reactive oxygen species in antigen-stimulated mast cells. J. Immunol. 181: 7706–7712.
. 2008. Reactive oxygen species produced up- or downstream of calcium influx regulate proinflammatory mediator release from mast cells: role of NADPH oxidase and mitochondria. Biochim. Biophys. Acta 1783: 789–802. 2007. Mast cells and eicosanoid mediators: a system of reciprocal paracrine and autocrine regulation. Immunol. Rev. 217: 168–185.
. 2001. Leukotriene B4: metabolism and signal transduction. Arch. Biochem. Biophys. 385: 231–241.
. 2005. Leukotriene B4, an activation product of mast cells, is a chemoattractant for their progenitors. J. Exp. Med. 201: 1961–1971.
. 2003. Leukotriene B4 and BLT1 control cytotoxic effector T cell recruitment to inflamed tissues. Nat. Immunol. 4: 965–973.
. 1990. Leukotrienes and other products of the 5-lipoxygenase pathway: biochemistry and relation to pathobiology in human diseases. N. Engl. J. Med. 323: 645–655.
. 2006. CD8+ T lymphocytes and leukotriene B4: novel interactions in the persistence and progression of asthma. J. Allergy Clin. Immunol. 117: 577–582.
. 2006. The leukotriene B4 receptor (BLT1) is required for effector CD8+ T cell-mediated, mast cell-dependent airway hyperresponsiveness. J. Immunol. 176: 3157–3164.
. 2006. A unique requirement for the leukotriene B4 receptor BLT1 for neutrophil recruitment in inflammatory arthritis. J. Exp. Med. 203: 829–835.
. 2010. Pro-survival of estrogen receptor-negative breast cancer cells is regulated by a BLT2-reactive oxygen species-linked signaling pathway. Carcinogenesis 31: 543–551.
. 2004. Role of the BLT2, a leukotriene B4 receptor, in Ras transformation. Oncogene 23: 9259–9268.
. 2008. BLT2 is expressed in PanINs, IPMNs, pancreatic cancer and stimulates tumour cell proliferation. Br. J. Cancer 99: 1064–1073.
. 2003. BLT1 and BLT2: the leukotriene B4 receptors. Prostaglandins Leukot. Essent. Fatty Acids 69: 123–134.
. 2000. A second leukotriene B4 receptor, BLT2: a new therapeutic target in inflammation and immunological disorders. J. Exp. Med. 192: 421–432.
. 2006. Leukotriene B4 receptors BLT1 and BLT2: expression and function in human and murine mast cells. J. Immunol. 177: 3439–3447.
. 2010. Blockade of airway inflammation and hyperresponsiveness by inhibition of BLT2, a low-affinity leukotriene B4 receptor. Am. J. Respir. Cell Mol. Biol. 42: 294–303.
. 2001. Hydroxyeicosanoids bind to and activate the low affinity leukotriene B4 receptor, BLT2. J. Biol. Chem. 276: 12454–12459.
. 1999. Chemoattractant receptors activate distinct pathways for chemotaxis and secretion: role of G-protein usage. J. Biol. Chem. 274: 37087–37092.
. 2010. Blockade of LTB4-induced chemotaxis by bioactive molecules interfering with the BLT2-Gαi interaction. Biochem. Pharmacol. 79: 1506–1515.
. 2009. Role of the low-affinity leukotriene B4 receptor BLT2 in VEGF-induced angiogenesis. Arterioscler. Thromb. Vasc. Biol. 29: 915–920.
. 2007. Peritoneal cell-derived mast cells: an in vitro model of mature serosal-type mouse mast cells. J. Immunol. 178: 6465–6475.
. 2009. Leukotriene B4 enhances the activity of nuclear factor-κB pathway through BLT1 and BLT2 receptors in atherosclerosis. Cardiovasc. Res. 81: 216–225.
. 2008. Lipoxygenase pathway receptor expression in ovarian cancer. Reprod. Sci. 15: 321–326.
. 2010. UVB radiation induces apoptosis in keratinocytes by activating a pathway linked to “BLT2-reactive oxygen species”. J. Invest. Dermatol. 130: 1095–1106.
. 2006. Inhibition of receptor internalization attenuates the TNFα-induced ROS generation in non-phagocytic cells. Biochem. Biophys. Res. Commun. 351: 972–978.
. 2005. Absence of leukotriene B4 receptor 1 confers resistance to airway hyperresponsiveness and Th2-type immune responses. J. Immunol. 175: 4217–4225.
. 2007. Selective activation of Fyn/PI3K and p38 MAPK regulates IL-4 production in BMMC under nontoxic stress condition. J. Immunol. 178: 2549–2555.
. 2005. Impaired FcεRI-dependent gene expression and defective eicosanoid and cytokine production as a consequence of Fyn deficiency in mast cells. J. Immunol. 175: 7602–7610.
. 2004. Rodent and human mast cells produce functionally significant intracellular reactive oxygen species but not nitric oxide. J. Biol. Chem. 279: 48751–48759.
. 2008. Reactive oxygen species are generated through a BLT2-linked cascade in Ras-transformed cells. Free Radic. Biol. Med. 44: 624–634.
. 2006. Mast cells can promote the development of multiple features of chronic asthma in mice. J. Clin. Invest. 116: 1633–1641.
. 2009. Interaction between prostaglandin D and chemoattractant receptor-homologous molecule expressed on Th2 cells mediates cytokine production by Th2 lymphocytes in response to activated mast cells. Clin. Exp. Immunol. 156: 126–133.
. 2005. Mast cells as “tunable” effector and immunoregulatory cells: recent advances. Annu. Rev. Immunol. 23: 749–786. 1991. Interleukin-4: a prototypic immunoregulatory lymphokine. Blood 77: 1859–1870.
. 2002. Direct effects of interleukin-13 on epithelial cells cause airway hyperreactivity and mucus overproduction in asthma. Nat. Med. 8: 885–889.
. 2003. FcεRI signaling of mast cells activates intracellular production of hydrogen peroxide: role in the regulation of calcium signals. J. Immunol. 171: 6119–6127.
. 2003. Oxidative stress stimulates IL-4 and IL-6 production in mast cells by an APE/Ref-1-dependent pathway. Eur. J. Immunol. 33: 2168–2177.